Unless Mr AStock5000 has bugged all our computers and put spy cameras in our houses then it's impossible to check if people are researching answers or not. I did all my answers off the top of my head except two where I checked a bus map for one possible answer to Q15 but I didn't use that option as my answer. The other was on Dennis Darts where I had convinced myself that Metropolitan Omnibus (who ran the 187 and 487 with weird looking East Lancs bodied single decks) had Darts. 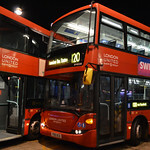 After some checking I found out they were Volvo B6s. Anyway I went with another "off the top of my head" answer to that question. I don't normally do quizzes on Forums but this one was nicely structured and well put together so it was interesting and a little taxing but not beyond the realms of my knowledge. Still wish I'd picked EC as the VLA garage and Maidstone Boroline for the Citybus operator. I might have won. All of my answers were from memory, although I did double-check that the Alexander Dash was correct with a friend! I found question 15 intriguing too, my methodology was to think of a route in Edgware that wouldn't seem obvious as taking you towards Waterloo, and the 251 seemed to fit perfectly (the 107 would've worked as well, but my answer was still unique so meh). After that, the 263 and 4 seemed to be the most obvious routes to get you to Waterloo, with a slight detour via Barbican! It's the first quiz I've done on this forum and I enjoyed it, so well done to astock5000 and I do hope some more appear! Thanks to everyone who took part and congratulations to twobellstogo!! Curses - beaten by being a bit too clever in a couple of places. I toyed with going for different answers on some and didn't. I am completely fascinated by the answers to no15. A few in there that never dawned on me which I find interesting. I wonder how much the answers are just how people's brains work relative to the knowledge they have and how much they are researched, clever answers designed to avoid the "obvious" answers. I think 1tocanadawater, busoccultation, snowman, TR* and hassaan's answers are particularly intriguing. Using the 251 and then 263 never entered by head. Indeed I was quite surprised seeing the routes that enter Z1 from the east or west. 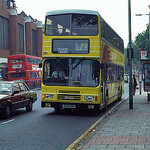 It would never have occured to me to go via Victoria, let alone Hammersmith or "around the top" via the 251! I almost went for the obvious answer of 113 and 139 which in the end would have worked out fine too . I also failed to specify where to change which luckily didn't cause issues .